After installing Office 2013, either through a media or Office 365 click-to-run (C2R) method, user will be prompted to sign in to Office 365 account or enter a product key to activate the Office 2013. However, despite signed in to Office 365 account with valid subscription for Office desktop apps such as Office 365 ProPlus, E3 or E4, or entered a genuine product key where the computer has been added to user’s account, individual Office 2013 app keeps prompting and asking for activation by signing in repetitively. The activate request normally happens when any of the Office 2013 apps, such as Word, Excel and PowerPoint, is opened. If you go to “File” -> “Account”, you will notice that the product is not activated yet. The issue normally happens if the activation was not done immediately after installation, or Office 365 has been previously installed but is now changing user account. For the activation to “stick”, Office 2013 requires administrator rights. Thus, to fix the issue, try the following trick: Right click on shortcut of Word 2013, Excel 2013 or PowerPoint 2013 in Start Menu or Start Screen, and select Run as Administrator. Then, activate the Office suite. 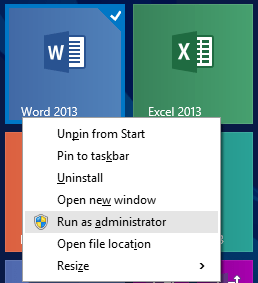 And, right click on EXCEL.exe, WINWORD.exe or POWERPNT.exe, and select Run as Administrator. Then, activate the Office suite. After reactivation, close and re-open the Office application and verify the result. Windows 8: On the Start screen, type Control Panel, and select Control Panel in the search results. Windows 7 or Vista: Click Start -> Control Panel. Go to Programs -> Programs and Features. Select the entry for Microsoft Office 2013, and then click Change. In Office 2010 or offline install of Office 2013, select Repair and click Continue. If running Repair still doesn’t solve the problem, you might need to uninstall and reinstall Office.